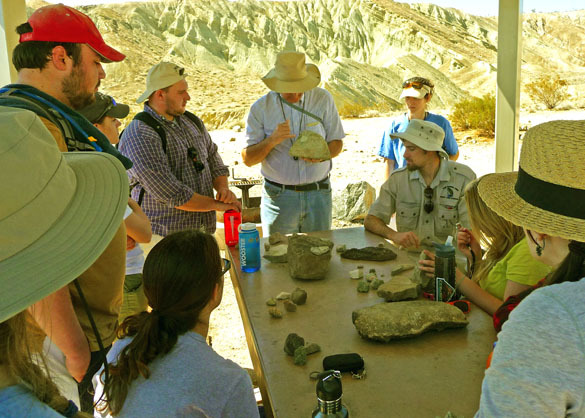 ZZYZX, CALIFORNIA–Today Team Mojave studied the remains of ancient lake systems in the dry, dry desert. 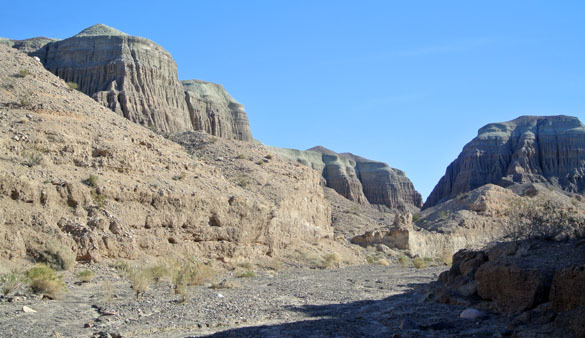 Early in the morning we drove west from Zzyzx to the Harvard Road exit off Interstate 15 and took a series of sandy roads to Bulwada Ridge on the shoreline of ancient Lake Manix. 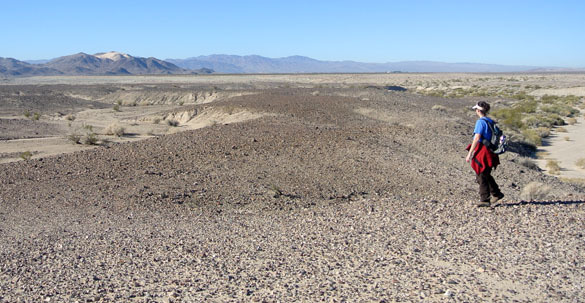 This Pleistocene, pluvial lake occupied a huge basin east of Barstow, California. Above we see laminated muds deposited in the lake itself. In the foreground are bouldery shoreline sediments. 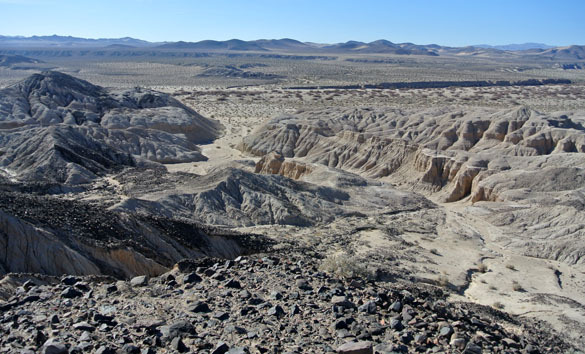 In the background you can see a scarp cut by the modern Mojave River (all underground at this point). Lake Manix was fed by the ancient Mojave River and supported a diverse fauna of fish and invertebrates. Just to the north of the shoreline are long, twisting gravel bodies. Meagen Pollock is pondering one which has been truncated by modern erosion and now is topped by a beautiful desert pavement. (She found a beautifully polished artifact on one of these surfaces, by the way. It is a scraper with one bifacially-worked edge.) These gravel deposits are ancient beach ridges made by storm waves on Lake Manix. A view from the other side of the table. Photo by Gary Wilson. 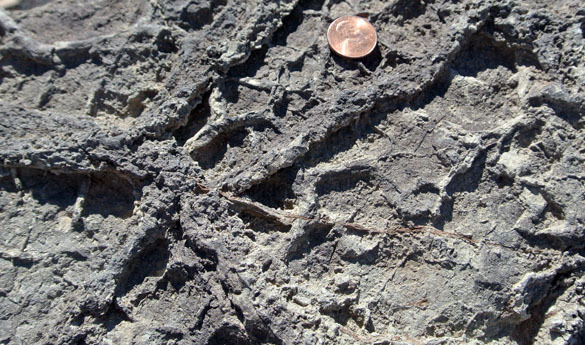 Kyle Burden found this beautiful example of two-stage desiccation cracks, preserved here as molds in the overlying sandstone. 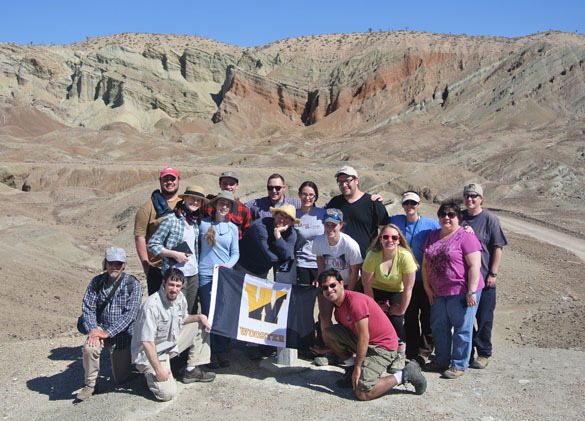 Another Wooster tradition is the group photograph in front of the outstanding syncline in the Barstow Formation exposed in nearby Rainbow Basin. 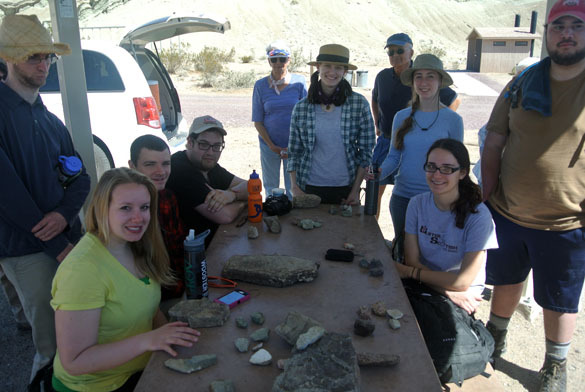 Our final stop was in Afton Canyon about 50 miles east of Barstow. This narrow passageway is where Lake Manix drained into Soda and Silver Lakes, apparently more than once in a catastrophic manner. We crossed the mighty Mojave Rover on foot and then walked up this side canyon to check out the flood deposits and the lake deposits high on the skyline. These mark the highest level Lake Manix reached before it overtopped its dam and drained very quickly. Another stimulating day which ended with a chicken dinner at the Desert Studies Center. Tomorrow we will return to the Barstow region but this time concentrating on structural issues and volcanic and plutonic rocks. Owl Canyon was definitely one of my favorite stops. Looks like you all are having a great time! !